In this multicultural city of ours there are eateries, restaurants and cafes that offer food to cater for every palate. But you become overjoyed when you happen to find a place where you can indulge in tastes you remember from childhood growing up in your home country. It may be the familiar spicy aromas floating out from the eatery that pulled me in, but I sure was glad I entered Mathura restaurant in Toongabbie. At Mathura I found curries I have only tasted during my short visits to Sri Lanka. Like the dark spicy Okra Curry. Or the ash plantain curry. The beauty of this place is that the curries available change each day. If you are in luck, you will actually walk in and find the most amazing crab curry that you have tasted. Mind you this one is hot. You will be sweating from top to bottom if you have the crab curry, but satisfaction is guaranteed. Not all curries are hot though. The dhal curry served here is never hot. It's actually mild enough even for a toddler to eat. There is a wide range of snack foods that are referred to as short eats in the subcontinent. These could be consumed as snacks, lunch or breakfast. 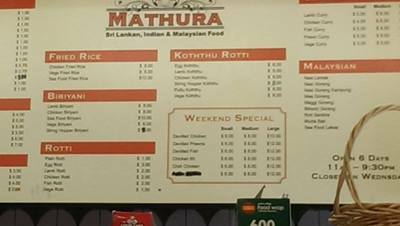 The short eats at Mathura ranges from Chicken rolls ($1.00) and Fish patties ($1.00) to Various types of south Indian savouries such as Paripu Vadai ($0.75), and Uludu Vadai ($0.75). While I waited for my take away curries to be served, I could not help but notice the serving staff carrying cup after cup of creamy milk tea to serve to the customers. It was evident the milky tea was a breakfast favourite. Curiosity taking the better of me, I too ordered the same. To my utter surprise and delight, it was the same taste that I had fallen in love with during my childhood when I was living in Sri Lanka. The same tea that was served by the white uniform clad waiters in a certain colonial style Rest house, where my family and I lunched during our travels around the island. It is rather sweet, but I am sure this is what tea is supposed to taste like. The staff here are very friendly and eager to explain the food to us before we order. 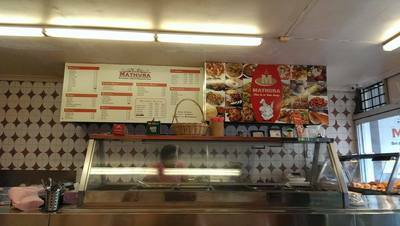 Mathura brought back memories, and if you are from the subcontinent or a lover of curry, I would recommend you head off to Toongabbie and try some hot freshly made curries and short eats there. Why: Freshly made curries and snacks, and for their short eats menu. Cost: Snacks start from only 75 cents. When: Breakfast, Lunch and Dinner.